Alfred Hitchcock’s first masterpiece brings almost as many laughs as thrills. The new Criterion Blu-ray gives this near-perfect entertainment a new polish and some interesting extras. The Lady Vanishes holds an interesting place amongst Hitchcock’s work. It was his penultimate British film before going to America. It is, in my opinion, his first true masterpiece. Aside from his two out-and-out comedies–Mr. & Mrs. Smith and The Trouble with Harry–this is easily his funniest picture. If North by Northwest is his light masterpiece (as opposed to more serious masterpieces such as Notorious and Rear Window), The Lady Vanishes is a close second. Yet for all of its lightness, this is a very political, almost didactic, motion picture. If you walked into this movie immediately after the opening credits, and thus missed the title and directorial credit, you’d spend nearly half an hour thinking you were watching a very funny screwball comedy. An unusually large number of British tourists have overrun a small hotel in a fictitious Central European country. They annoy the natives, have trouble with the language, and can’t understand why no one else seems to care passionately about cricket. Those two cricket enthusiasts, Caldicott and Charters, nearly steal the movie with their completely out-of-proportion view of the world. In fact, actors Naunton Wayne and Basil Radford enjoyed a minor career playing Caldicott and Charters elsewhere after The Lady Vanishes made the characters famous (that’s one fascinating tidbit I learned from this disc’s extras). The love interests also follow the screwball comedy formula. The ingénue, Iris (Margaret Lockwood), is an adventuress reluctantly giving up her wild life to marry a nobleman she doesn’t love. 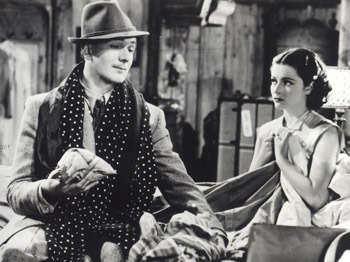 The juvenile, Gilbert (Michael Redgrave in his first major screen role), is a lively and non-conformist musicologist who seems incapable of taking anything seriously. They meet cute, of course, in a way that’s suspiciously similar to how Fred Astaire and Ginger Rogers first meet in Top Hat. And let’s not forget the cheerful, slightly daffy old lady (Dame May Whitty) who proclaims that "I never think you should judge any country by its politics. After all, we English are quite honest by nature." Not quite 30 minutes into the movie, the main characters all board a train for the first leg of their return to England. Iris befriends a the old lady, then takes a nap. When she wakes up, the lady is gone, and everyone on the train is insisting that she was never there. And thus the screwball comedy becomes a mystery, and a thriller. As Iris, with Gilbert’s help, try to solve the mystery, Hitchcock and his writers give us all sorts of reasons why people would lie about a woman disappearing on a moving train. The English characters either don’t want to be involved, or don’t want the train delayed. The lying continentals are are part of an evil conspiracy. And here we come to the movie’s politics. 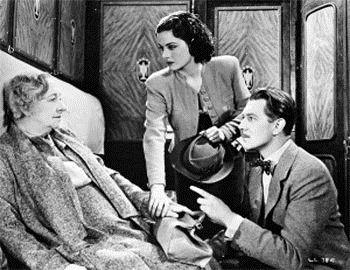 The Lady Vanishes was made largely in 1937, and released in 1938. In England, the big political question of the day was should we appease Hitler or prepare to fight him. With its evil Central European government, and its assortment of courageous and cowardly Brits, this picture clearly comes down on the side of preparing to fight. Historically speaking, that was certainly the right answer. The Lady Vanishes comes as a single disc in a clear, conventional DVD package (a little larger than a conventional Blu-ray package). An 18-page booklet contains cast and credit lists, two interesting essays on the film, and information on the transfer. As they should, Criterion presents this black-and-white Academy Ratio movie pillarboxed to the correct 1.33×1 aspect ratio. The transfer is crisp and detailed, capturing subtle shades of gray. This is not a film noir with deep blacks, but a picture shot with straight-forward lighting. The 1080p transfer captures fine details that you would otherwise only see on a good 35mm print. But in the case of The Lady Vanishes, that’s not always a good thing. This is not only a narrow-screen black and white movie, but a narrow-screen, black and white, British movie made on a low budget. Occasionally the rear projection and model work are painfully obvious. This is especially true with the first shot–a long dolly across a fake-looking miniature of a small mountain town. I’ve often wondered why Hitchcock didn’t shorten the shot considerably for take it out entirely; it’s not really necessary. Of course, that’s a complaint about the movie, not the transfer. Once again, Criterion has recreated an old mono soundtrack in uncompressed PCM. 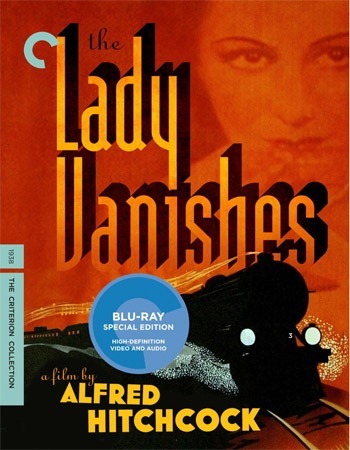 The Lady Vanishes was made long before magnetic recording replaced optical, so it lacks the dynamic range and signal-to-noise ratio found in Criterion releases of newer mono films, such as 12 Angry Men and Fanny and Alexander. But this is as good as The Lady Vanishes can sound without the sort of overprocessing that would only make it sound worse. Audio Commentary: Film historian Bruce Eder discusses the film’s making, the careers of various people who worked on it, and the political themes. Worth watching if you love Hitchcock or simply love this movie. Mystery Train: No, not the Jim Jarmusch film (damn!). This ten-minute video essay by Leonard Leff gives you yet another overview of the film’s production and themes. It’s not a repeat of the commentary; Leff and Eder have very different takes. Excerpts from Francois Truffaut’s interview with Hitchcock: For a few minutes, we listen to two great directors discuss The Lady Vanishes–through an interpreter. Stills and clips from the film add visuals to this otherwise audio-only experience. The best moment comes when Hitchcock laughingly points out how ridiculous the plot is when you think about it. Crook’s Tour: I told you some paragraphs back that Naunton Wayne and Basil Radford enjoyed a minor career reprising their Lady Vanishes characters, Caldicott and Charters. Here’s an espionage/mistaken identity feature they made with those characters in 1941. I managed to get through half an hour of it without laughing before I gave up. But the original Caldicott and Charters movie, The Lady Vanishes, offers plenty of entertainment. And the new Criterion Blu-ray disc provides one of the best combinations of thrills and laughs you can get in your own home. It goes on sale on Tuesday, December 6.